Exotic Caribbean Dessert Books from C.H.I.P.S. Embark on a culinary journey to the Caribbean islands in this three-volume series, and discover the sensouous delicacies of the distant tropical paradise. A cornucopia of flavors, dazzling colors and luscious fruits awaits you. The detailed instructions and color photos will not only help you succeed at every recipe, but will also inspire you to create your own tropical desserts. In addition, resourceful background information on the recipes and origins of the many exotic ingredients will allow you to gain insight into this unique culinary tradition, which blends the best of the islands with the expertise of the master chefs. These books are excellent resources for pastry chefs, dessert specialists, caterers, banquet directors, and all professionals and students involved in the creation, design, and preparation of desserts. A collection of unusual and traditional desserts ranging from crepes and delicate waffles to parfaits and fruit-filled tarts provides both simple and complex masterpieces. 100 plated desserts are included in this pictorial book, along with 17 basic recipes. Each finished dessert is presented in a full color photo with additional photos showing techniques. Background of the recipes and origins of the ingredients provides useful information for themes and menu descriptions. 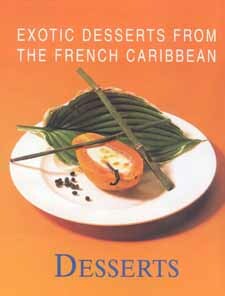 Exotic Desserts from the French Caribbean: DESSERTS has been translated from the original edition which is in French "D�lices des �les - Desserts Individuels". Every pastry chef needs this book!